My quilting journey started in 2003 and when the ‘bug’ bit, it bit HARD!!! I was consumed by all these beautiful fabrics and would often take my stash out of their drawers just to sort and stroke them (much to my husband’s amusement), feeling a sense of peace come over me – quilters will know this feeling only too well. I started my quilt teaching career in 2008 and completed the South African Quilters Guild Teachers’ Accreditation Course in 2014. I have a strong desire to share my quilting passion and as a traditional quilt teacher, I aim to give my students a solid grasp of the basic foundations of quilting. My goal for each student is that they are able to confidently apply what they have learnt and to feel empowered when they start a new project that may have previously seemed daunting. I have been very blessed with a husband and two daughters that understand and support my passion for quilting. My love affair with Kaffe Fassett fabrics started in about 2010, when I started building up my stash with a few running quarters every month, with the intention of making another quilt for my bed. Needless to say, the fabric was used for everything BUT the bed quilt! 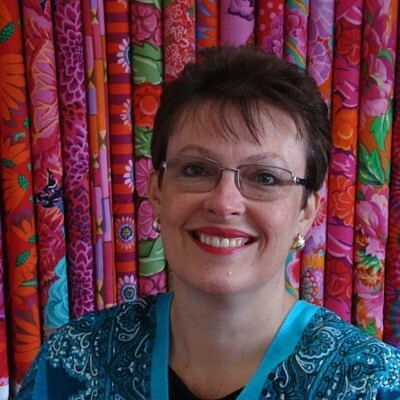 My husband encouraged my passion even further by encouraging me to expand my business to stock Kaffe Fassett fabrics – and the rest, as they say, is history…I have always believed that quality service and quality products will ensure a quality end result. To this end, my aim for May Gene is to not only provide instruction by SAQG Accredited teachers along with quality fabrics, but also to provide my customers with a choice of products that may not be readily available locally. If you are looking for something in particular, I will try my very best to source it for you.